Has our midfield found new heights? Scott Pendlebury and Jay Clark discuss the form of Collingwood's midfield group, free agency and much more on the latest episode of the Jock and Journo podcast. Collingwood captain Scott Pendlebury has been cleared of serious injury and remains in contention to play against Geelong at the MCG this Sunday. Captain Scott Pendlebury says Collingwood is starting to develop the familiarity within its playing group required to become a top AFL team. Perhaps the prototype of the modern midfielder. 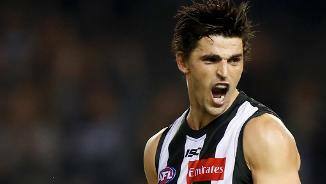 Sleek, skillful and slippery, Pendlebury is one of the bona fide stars of the competition. His graceful style of play belies his hardness, for he is a fierce tackler and renowned for his abilities at the bottom of the packs. 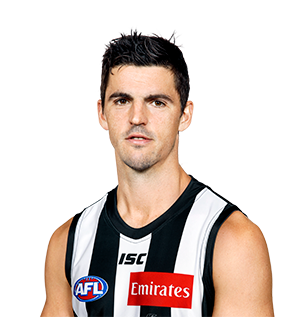 Pendlebury often appears to be playing at a different tempo to the other players on the field, such is his calmness that stems from playing as a point guard in basketball teams in his youth. Pendlebury boasts an imposing trophy cabinet, with his crowning glory a 2010 Norm Smith Medal. He is the captain of the club, a five-time Copeland Trophy winner and a five-time All-Australian. 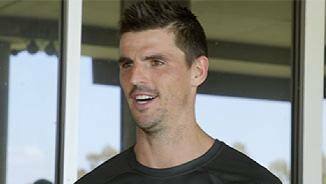 Yet as he approaches his thirties, Pendlebury is still arguably in the peak of his career. The consummate professional put in one of his finest seasons yet, polling 15 Brownlow Medal votes for the eighth time in as many years. Pendlebury began his fourth campaign as captain brilliantly, earning the three votes for his 35 disposals, 10 clearances and two goals against the Western Bulldogs in round one. He rarely lowered his standards in the weeks that followed, receiving best afield honours for his performances in wins against Geelong, Brisbane and Fremantle before the mid-season bye. Playing his 250th senior game against Hawthorn in round 15, it appeared nothing could stop him. Eventually, for the first time in five years, injury finally got hold of him. A nasty broken finger, suffered in the wet against Gold Coast, saw him sent for surgery in an early ending to an otherwise fine campaign. Pendlebury’s biggest highlight of the year came away from the playing field, when he and wife Alex became parents for the first time. Jax Michael Pendlebury was born on 15 May. Few players in the game could claim to be more consistent than the Collingwood captain. In a challenging year for his team, he stood tall all season long, combining early stints behind the ball with his usual brilliance in the centre square. The backline experiment was brief and divided opinion in the football world. While there was no doubt Pendlebury had the capacity to play the ‘quarterback’ style role at half back, his absence in the midfield arguably weakened Collingwood in the centre square. Rumours also circled about the captain’s fitness, as he appeared to juggle rib and back injuries in the early stages of the year. Only a player of Pendlebury’s calibre could shake off concerns without missing a game of football. He increased his disposal average from 25.8 per game in the first four rounds to 29.3 in the 18 remaining in the season. Brownlow votes came thick and fast through the middle stages of 2016. The captain polled in four consecutive games, despite Collingwood losses to Carlton (round seven) and the Western Bulldogs (round 10). He maintained his consistency despite battling a foot injury in the final weeks and inspired his teammates with his professionalism on and off the field. The result of a near flawless season – a fourth consecutive Copeland Trophy. The 28-year-old now sits equal with Len Thompson and behind only Nathan Buckley in the Magpies’ all-time leading best and fairest winners. By winning his fourth Copeland Trophy in 2015, Scott Pendlebury achieved a feat that only three other Collingwood players have done before. Joining the likes of Nathan Buckley, Len Thompson and Bob Rose as four-time winners is enough to describe the amazing legacy Pendlebury is currently leaving at the Holden Centre. However much more can be said about a season which once again displayed class, excellence and determination to succeed. He led from the front from the outset, collecting over 30 disposals in three of his first five games of the season. However the crowning moment came on a trip to the Gold Coast which delivered 35 disposals, three goals, eight inside 50s and three Brownlow votes. It also happened to be the captain’s 200th game, with Pendlebury reaching the milestone in just under ten seasons at the club. While Pendlebury set an ultra-consistent standard for the rest of his young teammates to follow throughout the middle stages of the season, perhaps the only game that truly rivalled his exhilarating form on the Gold Coast came in round 14 against Hawthorn. The Magpies pushed the reigning premiers to the limit on a wet Friday night before succumbing to a 10-point defeat. However despite the loss, it was hard to go past Pendlebury as the best player on the ground. His 37 disposals led all players on the ground, while he also led the field in both clearances (10) and tackles (10). While Collingwood’s form tapered in the back half of the season, Pendlebury retained his excellent form. Between rounds 19 and 22 he accumulated 133 disposals at an average of 33.3 a game. It was perhaps this form that cemented the 27-year-olds position as the Magpies best player and ultimately saw him rewarded with a landmark fourth Copeland Trophy victory. By this stage of his career, most supporters are becoming accustomed to Scott Pendlebury churning out the big numbers and match winning performances. It’s a fact that was reflected when he was named in his fifth consecutive All-Australian team in September, an achievement that capped off another stellar season. Pendlebury became the club’s 46th captain when Nick Maxwell officially handed over the reigns on 29 January during a ceremony at 333 Collins Street in Melbourne. He led the team out onto the ground for the first time in his own right in the NAB Challenge against Geelong – only he ran out onto Simonds Stadium while wearing the green substitute’s vest, reflecting the nature of the February fixture. Pendlebury’s captaincy tenure began like a dream, only for it to quickly evolve into a nightmare outing at Etihad Stadium. With the game just two minutes and four seconds old, Pendlebury kicked the first goal of the home and away season when he slotted one home on his left boot. But his team could manage just four more goals in the 113 minutes that followed, and while Pendlebury himself did what he could with 26 disposals and nine tackles, his Magpies slumped to a 70-point loss. The skipper helped steady the ship against Sydney, playing a critical role in the 20-point win on a night in which his leadership rose to the fore. He laid a game-high 10 tackles and registered a career-high 11 inside 50s, as well as kicking a team-lifting goal in which he and Maxwell combined to work the ball down the ground together by hand. As the weeks progressed, Pendlebury’s form became a key driver behind Collingwood’s rise back up the ladder. He kicked three goals in the win over Richmond and helped himself to 30 disposals on ANZAC Day against the Bombers. His consistency was perhaps the only bankable element of the Magpies’ form mid-season, as they tailed off after a strong start. Pendlebury enjoyed a huge final quarter against West Coast in round 10, kicking a goal on the burst to help his side to an eight-point win, while he collected 65 disposals in the space of two defeats at the hands of the Western Bulldogs and Hawthorn. He laid an equal career-high 11 tackles against Carlton on a Sunday night in round 15 and dipped below 25 disposals just once in his final seven games. The captain missed just one game, succumbing to a quad injury in the warm-up against Brisbane in round 21 when an errant Sherrin struck him on a cork. Another exceptional season from one of the most driven players in the competition. Pendlebury did not miss a game for the third time in the last four seasons and averaged a career-high 29.9 disposals per game. He opened the year with 30 possessions and a goal against North Melbourne and didn’t relent from there on. One week later, the left-footer iced a famous win over Carlton in round two with a superb goal from 50m out with seconds remaining before putting in best on ground displays against St Kilda in round six (28 possessions and two goals) and Sydney in round 20 (35 possessions and seven tackles). He saved one of the finest performances of his career for the Friday night clash with Adelaide in round 16 when he collected a career-high 42 possessions, laid five tackles and kicked two goals (one with each foot). The silky onballer had 30 or more disposals on 10 occasions and polled Brownlow votes in all bar two of those games. He entered the Brownlow count as one of the favourites and polled more than 20 votes (21 in total) for the third time in the past four years. 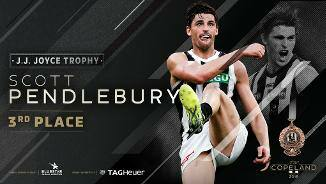 Didn’t have his usual impact in the Elimination Final loss to Port Adelaide (24 possessions and five tackles) but because the third Collingwood player to win the coveted AFL Coaches Association’s Player of the Year Award. The silky smooth midfielder with enviable skills and evasive qualities was let down only by a mid-season leg fracture that robbed off four games. Started the year well and was averaging more than 28 disposals a game before his injury. Came back against Geelong in round 16 for 36 possessions but his effectiveness was down. Fought back to win his second straight Bob Rose Award as Best Player in Finals after a stunning performance against Sydney in the Preliminary Final. Finished second in the Copeland Trophy and earned his third consecutive All-Australian honour. Signed a four-year extension early in the season. Most players would be satisfied with a season like Pendlebury had in 2010, but the vice-captain took it to another level in 2011. Averaged 29.7 disposals in all 25 games (never dipping below 20 in a match), kicked 24 goals (including three in both matches against Essendon) and polled 24 Brownlow votes to finish equal third. Confirmed his reputation as a big game player in averaging 34.3 disposals during the finals series, and was one of Collingwood’s best in the Grand Final loss to Geelong. Named on a wing in the All-Australian side and capped off his year with his first Copeland Trophy. A season to remember. Named in the All-Australian team (on the interchange) for the first time, polled 21 Brownlow votes, won his first Anzac Day Medal in round five, and ran second in the Copeland Trophy. But none of this compared to his Norm Smith Medal in the Grand Final replay and his first premiership at the age of 22. After an uncharacteristically quiet first Grand Final, where his impact (19 disposals, six tackles) was lessened by gastro, Pendlebury fought back in the replay (29 disposals, 11 tackles) en route to his Norm Smith Medal. Averaged 26.6 disposals and 5.5 tackles for the season and finished fourth in the Brownlow Medal. Began to attract more attention from the umpires, accruing 13 Brownlow votes. Gathered 30 or more disposals in eight matches, but didn’t have the scoreboard impact he may have liked (eight goals in 21 matches). Won a career high 39 disposals against Melbourne on the Queen’s Birthday. His importance to the side was underscored when he broke his leg early in the qualifying final against a rampant St Kilda, sidelining him for the rest of the season. Suddenly, Collingwood’s midfield had lost its prime mover, severely impacting upon its fortunes for the rest of September. Finished sixth in the Copeland Trophy. Continued his improvement, averaging 22.5 disposals and was selected in the Victorian team in the AFL Hall of Fame Tribute Match. Elevated into the club’s leadership group in the pre-season. His best match of the season came on Anzac Day in round six, when he amassed 26 disposals and seven tackles against the Bombers. Played his 50th game in round 19 against St Kilda, and again stood up in the finals, with over 20 disposals in both matches. Surprised many with a definitive breakout season. Changed to guernsey no. 10 after Blake Caracella’s retirement. Averaged 18.9 disposals, 3.3 tackles and booted 20 goals across 23 games. Nominated for the AFL Rising Star after the round four loss to Port Adelaide. Broke his foot minutes into the loss to Brisbane in round 17 but remarkably missed only two games. Enjoyed an excellent September, gathering 24 disposals against Sydney in the elimination final and 26 as the semi final against West Coast went into extra time. Kicked the sealer in the win over the Eagles late in the second half of extra time. Finished his second season as runner up to Travis Cloke in the Copeland Trophy, and finished second to Joel Selwood in the NAB AFL Rising Star. Impeded by glandular fever during the pre-season, but quickly made up ground for Williamstown in the VFL. Won a senior promotion in round 10 after he was named as an emergency in three of the previous four matches. Debuted against the Brisbane Lions on a Saturday night at the MCG wearing the N.o 16 jumper. Goaled with his first kick, marking a pass from his captain Nathan Buckley. Missed only one of the next 10 games due to illness. Omitted for round 20 and remained an emergency for the final month of the season, including the Elimination Final loss to the Western Bulldogs. Began the year on a basketball scholarship at the Australian Institute of Sport. Quit on the eve of the football season, and having not played football since under-12s, trialled for Gippsland in the U18s. Improved rapidly and was selected for Vic Country in the National U18 Championships, where he averaged 17 disposals. Was a part of the Gippsland U18 premiership team in the TAC Cup alongside Dale Thomas, with Tyson Goldsack and Brent Macaffer also named in the squad. Was something of a surprise selection at pick five in the National Draft.